Welcome to All Family, Friends and History Buffs! The purpose of this website is promote and preserve the history and heritage of our family and our reunion. A secondary purpose is develop our family tree(s) to the point where we can get some clue as to how many descendants actually exist. Click on and zoon on photos for larger views. A twelfth child Elijah lived about three months, and there is no picture of him. There is also no known picture of Coleman Jarred (Jart) Hudson. On this website, we have a Photos page for each child (Family Unit) of CJ & MJ. A picture of the child as a grownup is at the top of the page with a listing of wives and children underneath. We also a spreadsheet version family Tree page for each Family Unit. The FAMILY TREES page may help you determine, if you don’t know, to which Family Unit tree you belong. Click on and zoom on spreadsheets for larger views. 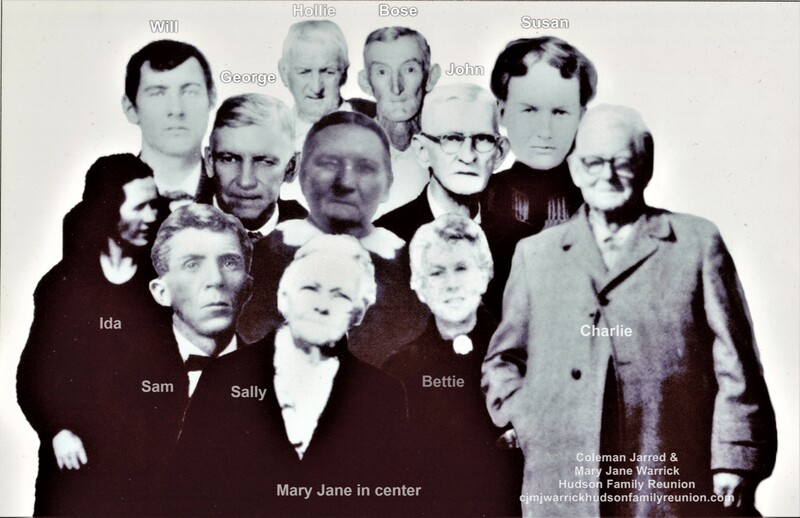 Coleman Jarred and Mary Jane had eleven children who produced more than 80 children of their own, most of whom had children of their own. We have now reached up to six generations in some family units. We have identified over 1000 descendants thus far, but we know this is probably only a fraction of all descendants. 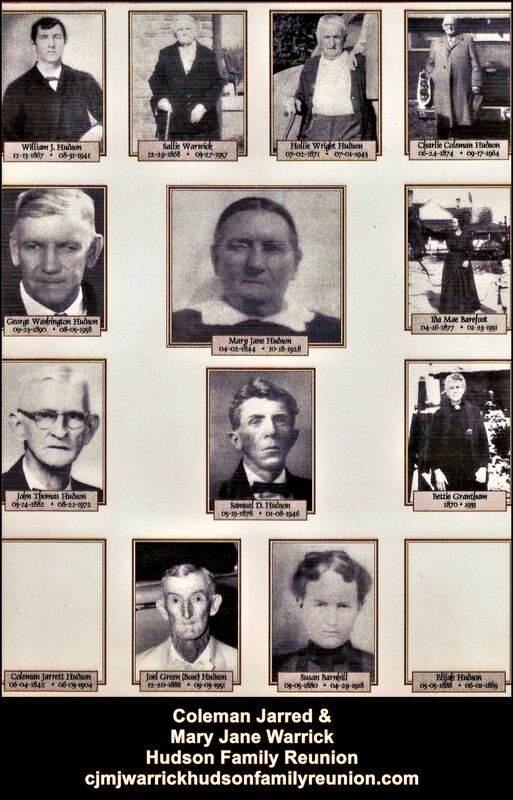 The History/Life (Homestead Farm) page utilizes old photos to discuss the history and lifestyles of our ancestors from the burial of Elijah in the Hudson Cemetery in 1889 until the death of the youngest son of CJ & MJ, and heir to the plantation, George Washington Hudson, in 1958. We discuss this period of time because it is generally unknown which buildings and landscape features existed during the time of CJ & MJ, and very few if any photos were taken during their time. 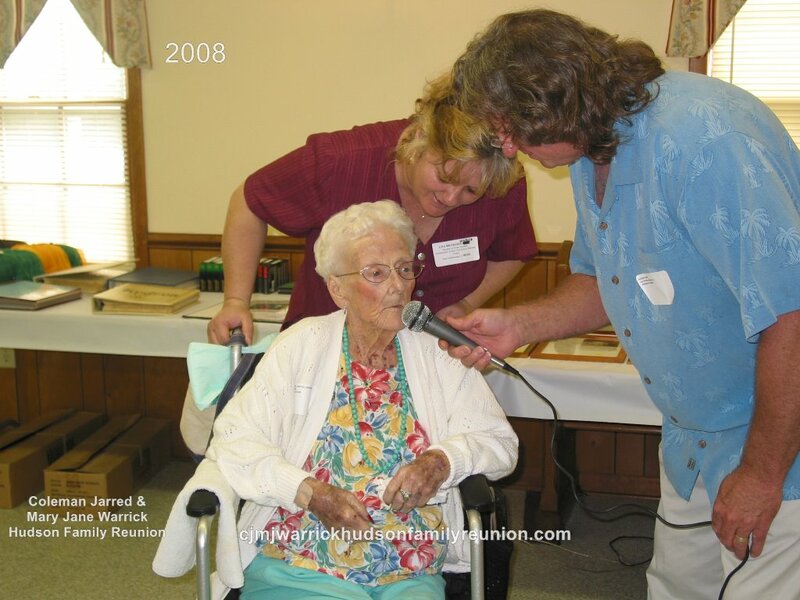 The principal founder of our reunion was Janie Doll Hudson Brasher Wallace. You can learn more about her on the Reunion Honorees page. The first annual reunion took place in 1974 in Taylors Bridge, North Carolina, before being moved to the Turkey Community Building in Turkey, North Carolina, two or three years later. 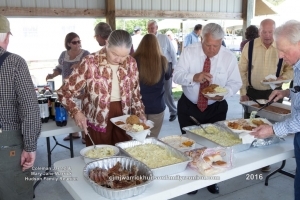 The reunion took place at the Turkey Baptist Church Fellowship Hall in 1986 and has met there every year since except two. In 1993, the reunion took place at Shady Grove Baptist Church in Timothy near Spivey’s Corner, North Carolina. Coleman Jarred was born in Timothy and lived there until about the time of the Civil War. He then lived in the Grantham community in Wayne County before moving his family to Turkey. There quite a few Hudson graves in the cemetery across the road from the church. There are pictures on the Photo Albums page from this reunion. In 2016 the reunion took place at the Hudson Manor, former home of CJ & MJ, on the Hudson Homestead Farm. This event was hosted by resident David Dwight Hudson Sr. who was born and has lived in the house since his birth in 1934. He inherited the home from his father, George Washington Hudson, in 1958, who inherited the home from his father, Coleman Jarred (Jart) Hudson, in 1904. 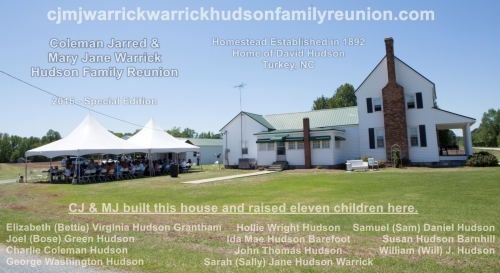 The picture of the home on this page was taken at the 2016 reunion. You can learn more about David on the Reunion Honorees page. There are photos dating back to 1979 on the Photo Albums page. Although we do not have photos before 1979, nor for 2013 and 2015, still over 500 different descendants are portrayed in reunion photos. The schedule on the Photo Albums Index page shows the years that each descendant appears in photos.